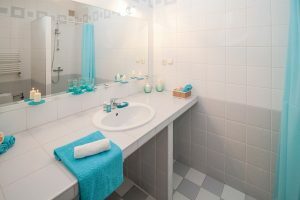 The exhaust fan in the bathroom is one of the most overlooked, under cleaned elements in a home. While this has not been empirically proven through scientific analysis, just ask anyone the last time they cleaned their bathroom exhaust fan. Call anyone. Text them if you’re too busy. What did you find out? That’s right, nobody cleans their bathroom exhaust fans. Well they should! It’s important for the overall cleanliness of your bathroom to have clean exhaust fans. They contribute to ventilation and the quality of air! Realize that your bathroom exhaust fan is tiny and delicate. If it completely gets clogged up with dirt, it can risk breakage or burning up the motor. This can have a significant impact on the air quality of your bathroom. That would be no good. Now that you understand how underperformed and underrated cleaning your bathroom exhaust fan really is, let us get into the nitty gritty of how to pull that sucker apart and get it cleaned! Taking off the fan cover usually can be done with a screwdriver or by depressing clamps and clips to remove the cover. Once the fan cover is off, you’re ready clean the cover first. The cover probably has some dirt and grime built up, so you’ll want to spray it with a cleaning spray that can cut through grime. An all purpose cleaner should do fine. Spray the cover on both sides and wipe it clean. When cleaning the fan itself, you want to be a little gentler than you were with the cover. Before you start spraying, use a vacuum hose to remove any loose dust or dirt from around the fan wherever you can. Spray and wipe the blades clean. As you clean, try to reach the spindle of the fan. If the spindle is kept clean then the fan will be able to spin faster and perform better. Be most careful with the duct and motor to avoid damaging them. A spare toothbrush is great for combing over the motor and duct to knock loose dirt and dust that has gathered and clumped around the unit and duct. The motor and duct are clean. The fan itself is clean. The fan cover is clean. Now all you have to do is replace the cover and you’re all set! Remember to clean your bathroom exhaust fan regularly, as it directly impacts the quality of air in your bathroom.